Our decision making panel, made up of local residents, selected three local groups and artists to deliver a wide variety of creative activities for adults in the borough in 2018. These were Susanna Wallis with Mosaic workshop, Laura Iosifescu with outdoor painting sessions and Green Shoes Arts using arts, drama and music combined to create interactive performances and animate the park spaces in the borough. Thank you for joining us for the Get Creative sessions in 2018. Watch this space for future creative and artistic activities. The CBD Get Creative programme is also aimed at supporting emerging artists and creative practitioners from the Cultural Connector network, to provide them with opportunities to gain experience in leading and coordinating classes. In turn, this is aimed at building capacity within the local arts sector, so that artists and creative practitioners from the Cultural Connector network may play a greater role in the wider arts sector in the future. 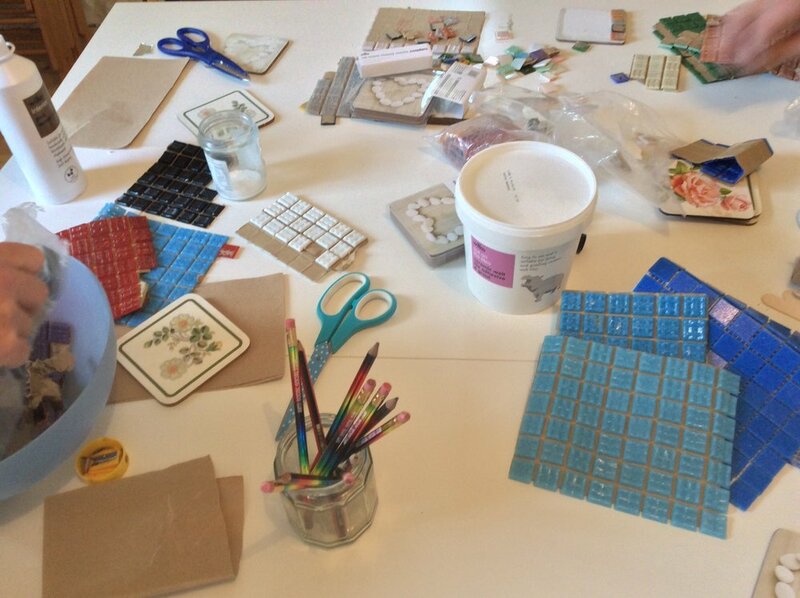 Our creative mosaic workshops with Susanna Wallis took place at two sites in the summer of 2018. During the day you could join the sessions at Dagenham Church hall and in the evenings The White House hosted the drop in sessions. Participants, most of whom had never created a mosaic, were taken through the step by step process of creating a mosaic, exploring techniques and materials for them to be confident in and pursue their own creative mosaic projects in the future. Green Shoes Arts led workshops covering Set Design, Sound and Drama and working with local participants created an interactive Treasure Hunt. Inspired by the borough, they wanted to invite audiences to see familiar spaces in new ways. The installation and performance was showcased at DAGFEST 2018 as part of the festival programme. The painting sessions with Laura took place across June and July in 2018 at locations across Barking. Including the River Roading, Barking Park and Eastbury Manor House. The final pieces came together in a wonderful show in August 2018 at the Laura I Gallery in the Ice House Quarter. Laura spoke with the One Borough Live team about the series of workshops. Where did the Get Creative programme come from? Get Creative is a programme strand, for CBD Phase Two (2016-19), informed by the experiences of delivering the Neighbourhood Commissioning Fund. The aim of this CBD programme strand is to commission regular creative classes or workshops, in targeted areas of low provision, for adult attenders. In 2017 we ran two types of activity in the lead up to DAGFEST including Flamingo Puppet creations with Del Taylor and Movement, Rhythm and Percussion workshops with Mathis Richet.